The cake looks much more appetizing and attractive if it is beautifully decorated. It can be spread with cream, sprinkle with candied fruits, nuts, beans, fruits, marzipan and so on. How to do you tell your imagination and taste. 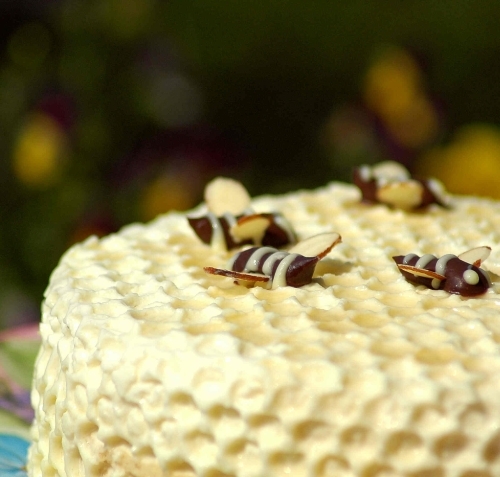 As decoration for the honey cake is evident. Why not do it with the honeycomb and bees. To make the honeycomb, use wrapping film with pimples. Melt the chocolate in a water bath. Slather it on the surface of the film, not very thin, but not thick. You need to ensure that the chocolate has filled the hole between the bumps. Place the film on a flat surface, put in refrigerator and allow chocolate to harden. When chocolate is set, remove the foil from the refrigerator and remove it from the film. Do this as accurately as possible, as it is quite fragile. But if it still fails – it doesn't matter. Cake decoration you can use small fragments. So, it turned out the cell. Bees make from nuts. For wings, use flaked almonds and for the body you can use cashews, peanuts or almonds the same. Almond fold two petals, like wings. Put on them a modicum of cream or melted chocolate out of the syringe and put them on cashews. Apply the strips of chocolate. Squeeze the two points where you think should be the eyes. Bee ready. Make a few of these bees to make a swarm. Brush the cakes with cream or condensed milk. To make the cream, soak the gelatine in cold boiled water for an hour. Then bring down the sour cream with sugar. Heat gelatin, not boiling, pour in a mixture of sour cream with sugar, wait, the mass was slightly viscous and sticky. Fold the phyllo pile. Cut them exactly. Edge and spread with cream and sprinkle with flaked almonds. Sprinkle with crumbs, made from scraps of cakes, and chopped nuts: peanuts or almonds. Put the honeycomb, and attach the top with a cream bees. That's all. The cake is ready, but before I buy them of his household or guests, the cake should stand a few hours to cakes soaked in cream. Then he will become tender honey-caramel flavor and will just melt in your mouth. You can decorate the cake with honey and inscriptions, which are made from melted chocolate. Apply a decal to wrap and allow chocolate to harden. Now you can remove foil and cake decorating cute lettering greeting.